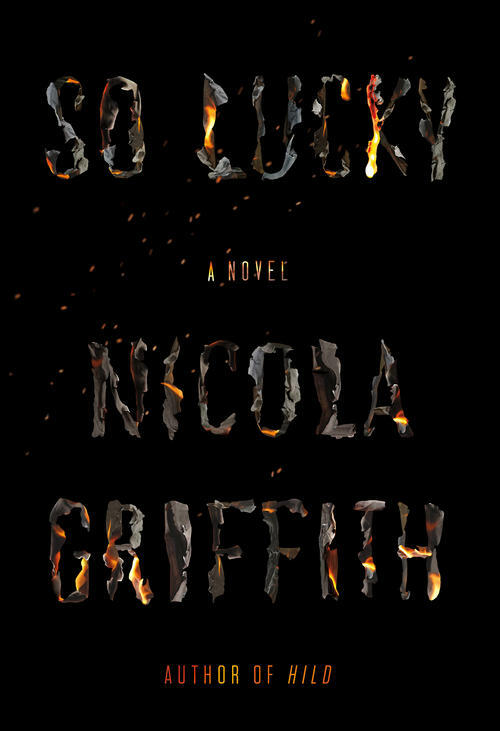 So Lucky is an urgent, angry, vital, powerful novel. Mara Tagarelli is used to being in control. She is the driving force behind a multi-million dollar AIDS nonprofit. She trains martial arts. She is accustomed to her body doing exactly what she want it to do when she wants it to do. In the same week, but otherwise not connected, Mara's wife of fourteen years leaves her and she (Mara) is diagnosed with multiple sclerosis. The divorce and the diagnosis are not connected, but symptomatic of the direction Mara's life is headed. Things are being stripped away bit by bit. Her friends who fade away. The sympathetic smile from the martial arts instructor coupled with how she also seemed to close off at the same time. The microaggressions of inaccessibility and invisibility. The growing sense of defeat as her body begins to fail. So Lucky is an angry and aggressive novel. Mara's default mode is to fight back, to challenge herself and to challenge the problem, except this is a problem that doesn't respond quite as well to punching back. The last time I had been this angry, this afraid, I trained my body to be a blade. But now I had MS. I don't know if I'm using the right words to describe So Lucky. I don't know Mara's anger. I don't know disability or what facing daily microaggression feels like. Nicola Griffith makes you understand and she makes you care. She brings the reader as deep into Mara's head as possible. Mara's rage and fear is palpable. Rage over her loss of control and loss of autonomy. Fear over being a target for violence, for the greater opportunity for being a victim. Having MS did not make me a different person, it did not make me better or special, just a person with impairments. So Lucky is a novel of identity. Griffith directly addresses the question of how a disability does and does not define a person. While there is anger underpinning so much of So Lucky, I don't want to ride that idea too hard. So Lucky is also a beautiful novel. Some beauty is soft and painted in gentle tones and soaring music. This is not that novel. Some beauty is hard, edged, and razor sharp. If I describe So Lucky as a beautiful novel, it's because Griffith's edge is so finely honed, so cutting that the beauty is in its danger. The beauty is in how cleanly it can cut deep while barely leaving a trace. Bonuses: +1 because even though Nerds of a Feather is a genre blog and So Lucky is maaaaaybe 1% genre (which is honestly stretching a different point the novel is making about Mara into something that a genre reader might process differently / incorrectly), this is a novel I read in one sitting and just had to tell someone about. I can't imagine it won't be on my list of the top novels of the year. Penalties: -1 because there are moments where So Lucky is perhaps a touch too strident. This is a small issue, but worth noting.